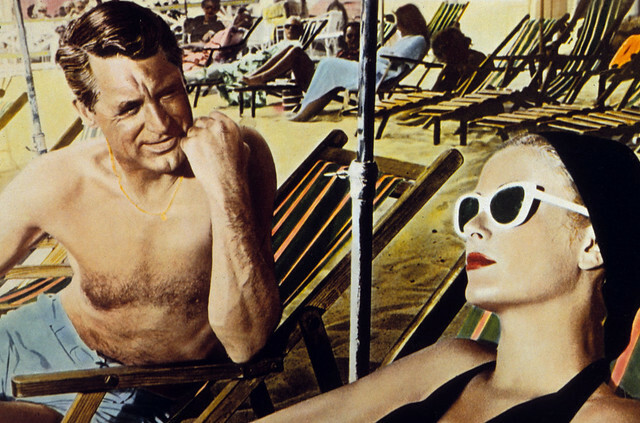 Today, I'm taking a break on the French Riviera with one of my favorite films, To Catch a Thief (1955). Here are stars Cary Grant and Grace Kelly in a colorized German ad. This article is part of The Beach Party Blogathon hosted by Speakeasy and Silver Screenings. Go here for more cool entries from the best movie bloggers in the business. To Catch a Thief (1955) isn't one of director Alfred Hitchcock's most profound works. Instead, it's a stylish, frothy entertainment filled with stunning scenery, elaborate costumes, and gorgeous movie stars. 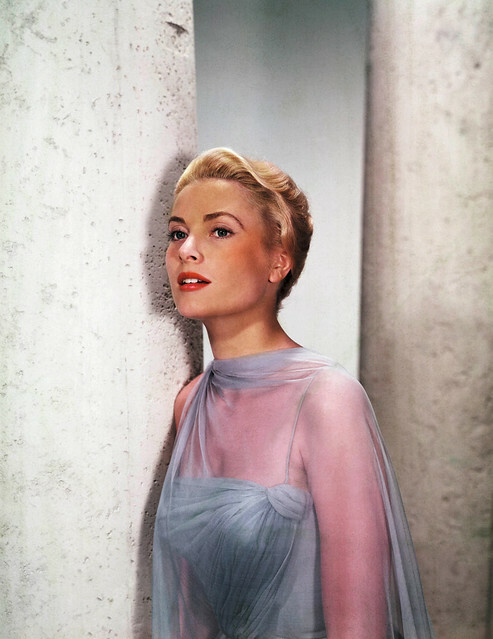 Grace Kelly in one of the beautiful Edith Head costumes she wore in To Catch a Thief (1955). By 1955, Hitchcock and Kelly, his favorite leading lady, had been through two grueling productions -- Dial M for Murder (1954) and Rear Window (1954) -- so he decided their next film would be a seaside holiday of sorts. Hitchcock acquired the right to David Dodge's 1952 caper novel (the title is taken from the old saying, "it takes a thief to catch a thief") before it was published, but Hitchcock had to wait several years for the perfect leading man. The director always wanted Grant for the lead role, but, after a career slump in the early 1950s, Grant retired to spend more time with his wife, Betsy Drake, and presumably to work on his tan (not even George Hamilton can approach the bronzed perfection of Grant in this movie). 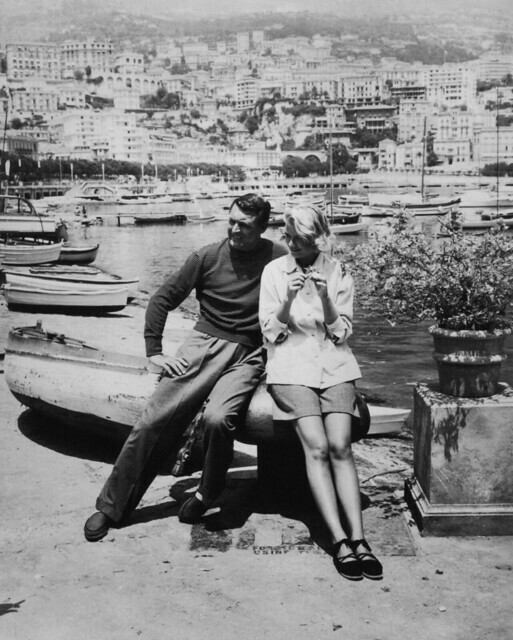 Cary Grant and Grace Kelly take a beachside break while filming To Catch a Thief (1955) in the French Riviera. Hitchcock finally lured Grant out of retirement and the crew headed to the south of France for filming. The finished movie is wonderful escapist fare with great chemistry between Grant and Kelly. In fact, To Catch a Thief was a momentous event for both stars. The movie successfully revived Grant's flagging career and re-established him as a romantic leading man in blockbusters like An Affair to Remember (1957) and Hitchcock's North by Northwest (1959). 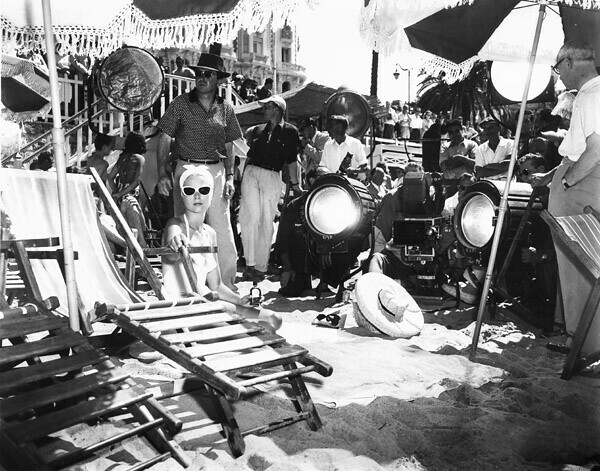 Grace Kelly and the crew of To Catch a Thief (1955) prepare for a beach scene. To Catch a Thief gave Kelly her first glimpse of Monaco, although she didn't meet her future husband, Prince Rainier, until she attended the Cannes Film Festival in 1955. Kelly's 1956 marriage to Rainier was an international event, and Kelly was a great asset to Monaco until her untimely death in 1982. Kelly suffered a stroke while driving a car on one of the mountainous roads in Monaco that Hitchcock used to such great effect for car chase scenes in To Catch a Thief (It has been widely reported that Kelly was a reckless driver, but that is incorrect. She suffered a brain hemorrhage that caused her fatal accident). Grace Kelly waits to film the famous fireworks scene in To Catch a Thief (1955). Even with the star power of Grant and Kelly, To Catch a Thief would have been an average jewel heist movie without Hitchcock's genius. Screenwriter John Michael Hayes, who worked with Hitchcock on four films, often commented in interviews on Hitchcock's "knowledge of the visual," which is on full display in To Catch a Thief. The movie has many dazzling set pieces: two breathless car chases over winding country roads, the police pursuing Grant through an open-air flower market, and a lavish costume ball. Hitchcock expertly controls the style and tone from the first scene (clip below). The director lulls the audience into a false sense of security during the opening credits, which feature lush music and enticing travelogue photos. This mini-vacation is broken up in the film's opening seconds by a sharp cut to the shrill sounds of a woman's screams. The famous fireworks sequence is the piece de resistance in To Catch a Thief and one of the best single scenes in Hitchcock's storied career. Fireworks as a metaphor for intimacy were used before in films -- for example, director David Lean uses them in much the same way in another wonderful 1955 film, Summertime -- but Hitchcock, an almost unparalleled master of cinematic language, raises the stakes. Most directors simply show a couple kissing and then cut away to the fireworks, but Hitchcock's method of crosscutting between the fireworks and Kelly and Grant inching closer and closer together changes a tired cliche into a tour de force of cinematic seduction (clip below). To Catch a Thief is available on DVD and video on demand. It is sometimes hard to believe that all that glamour is on the same planet that I live on! The drollery of John Williams keeps it real. Williams has the perfect stiff upper lip. He even wears a bow tie on the beach. Thanks for bringing this beautiful film to the blogathon! Loved your review! Great information about getting Grant to play the role and how it affected his career. I also didn't know that Kelly had a stroke while driving. "Knowledge of the Visual" to describe Alfred Hitchcock is perfect. I hadn't heard that before. Makes me want to see this again! Here's I really fascinating New York Times article about Grace's death: http://www.nytimes.com/1982/09/17/world/princess-stricken-before-crash-doctors-say.html. I hope non-subscribers can look at it. Up there with my Hitch faves just because of how good it looks - Kelly's costumes are wonderful too. The last time I went to the South of France I insisted on visiting a lot of the locations in the film, they really are just as beautiful in real life! I agree on Kelly's costumes. Some of Edith Head's best work! Great choice, besides all the beautiful things about it, this is the one that makes me think what wonders Hitch would have done with the Talented Mr. Ripley. Thank for taking part in the blogathon! The Talented Mr. Ripley is a good movie, but sometimes I just wanted to shout at the screen, "Stop ripping off Hitchcock'"
Enjoyed your review - Grant and Kelly make a great couple. I need to see this again soon! Great review. I haven't seen To Catch a Thief in years. Now I want to re see it and soon!